The same house, the same furniture, the same design (except the lights), I believe that most people should want to live in the second home. Because many people’s demand for lighting has far exceeded the basic needs of lighting. There are three main ways of home lighting layout: basic lighting, accent lighting, and decorative lighting. 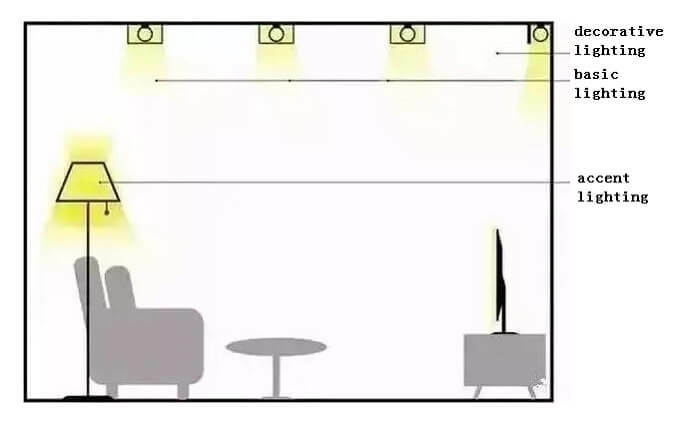 Using the downlight as the basic illumination, there is no concept of the main light.The positions and number of the downlight are set according to the size of the room. The downlight can be embedded in the ceiling or it can be mounted on the surface. When you read and write, you definitely need a reading light, special reading lighting; when cutting vegetables on the chopping board, you need several lights to illuminate the vegetables… just like this, when you are doing some work and focusing the protruding area,the major lighting is also called functional lighting. Decorative lighting in the luminaire enhances the change and layering of the space to create an atmosphere of the environment.Common lamps are led strips, string lights, wall lamps, table lamps, and spotlights,etc.